Portsmouth, Virginia, recently announced that they intend to invest in fiber optic infrastructure to reduce telecommunications costs, encourage economic development, and keep the city competitive in the region. The project is also part of a regional effort to foster economic development in the Hampton Roads metropolitan area. In the April press release, the city announced that the project will include a 55-mile fiber optic ring around the city that will connect municipal facilities and anchor institutions. The plan will use a five-year multiphase approach for the estimated $9 million capital project and construction is likely to begin this summer. According to city CIO Daniel Jones, costs for the first year will come in at around $2.7 million. Portsmouth is currently reviewing bids for the project. Last year, the city adopted a Fiber Master Plan, which analyzed potential cost savings, should Portsmouth choose to invest in its own Internet network infrastructure. Consultants estimated that the city and public schools spend more than $1 million on connectivity costs per year for municipal facilities, schools, and public libraries. The community’s schools’ telecom expenditures are almost $638,000 per year; libraries spend around $29,000 per year. Portsmouth schools receive an 80 percent reimbursement from the federal E-rate program, which allows the school system to receive a subsidy of more than $510,000 annually. Portsmouth plans to use E-rate dollars to help fund network construction in areas where it serves school facilities. At the Institute for Local Self-Reliance, we often write about improving broadband availability. Access is only the first step. Even in places where broadband is available, it may be unaffordable. To that end, the National Digital Inclusion Alliance (NDIA) sponsors events in early May each year on the importance of digital inclusion and equity. Everybody likes to watch a good film and if it involves drama, government at its highest level, and the deep pockets of corporate America, there's sure to be intrigue. We've found an independent film project that people interested in telecommunications policy and the Internet should consider backing. "The Network," a documedia project directed by Fred Johnson will take a look at how the Internet has come to be controlled by only a small number of large and powerful corporate entities. There are only a few days left to contribute to the IndieGoGo account so this project can move forward and we encourage you to consider adding "independent film producer" to your resume. We occasionally produce videos and have worked with Fred, so we know that he is committed to a quality result. And, hey, a movie about Internet policy? How cool is that, amIright? And check out this cool trailer! We have interviews lined up with former FCC Commissioners, Nick Johnson and Michael Copps, former FCC Special Counsel Gigi Sohn, writer and professor, Fred Turner, author of From Counterculture to Cyberculture and The Democratic Surround, and activist Anthony Riddle, Senior VP of Community Media, BRIC TV, Brooklyn. More to come. The Trump Federal Communications Commission’s decision to do away with Net Neutrality protections makes it very clear we are in the midst of real crisis in U.S. communications policy: the underlying public interest agreements between the public, government and U.S. commercial communications corporations have broken down. The Facebook hearings in Congress marked the moment when the failed free market communications policies of the last 4 decades have revealed their ultimate logic: we now have monopoly social media platforms surveilling our networks, and unregulated monopolies (that are really utilities) selling us overpriced access to our networks. With no government oversight of any significance. Generate conversation about broadband access in your community with a screening of the short film, "Do Not Pass Go." We have created a helpful guide on how to host a screening of the film in your community. Spend some time connecting with others who share your questions about local options and want to learn more. Documentary filmmaker Cullen Hoback traveled to Pinetops, North Carolina, to experience firsthand the battle between municipal networks and private providers. Pinetops is a rural small town that receives high-speed Internet service from the nearby City of Wilson, North Carolina. The large ISPs have tried to put a stop to this with a state law, and all the red tape might kill the small town. "Do Not Pass Go" from Hyrax Films on Vimeo. Not sure how to host a screening? Get going with this guide. The guide is 13 pages long and is available for download as a PDF. We produced the guide with Next Century Cities. There have already been three screenings across the U.S. in Marietta, Ohio; Atlanta, Georgia; and Rochester, Minnesota. The community group Broadband & Beers has a planned screening for April 17th, 2018, in Boulder, Colorado. Let us know if you show the film in your town! The North Carolina League of Municipalities (NCLM) released a report in March with several recommendations designed to help the state boost connectivity for residents, businesses, and organizations. NCLM Legislative Counsel Erin Wynia and CTC Technology and Energy President Joanne Hovis authored the report that offers policy changes to encourage smart partnerships. 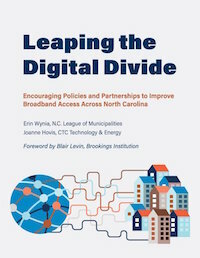 Download the report, Leaping the Digital Divide: Encouraging Policies and Partnership to Improve Broadband Access Across North Carolina. The report dedicates time describing different public-private partnership models and the elements that make them distinct. In recent years, the term has been used to describe a broad spectrum of arrangements. We've highlighted partnerships in places like Westminster, Maryland, and Urbana-Champaign, Illinois, where both partners invest and share in risk and reward. Wynia and Hovis spend time on the gap of coverage in rural areas vs coverage in urban areas. They compare data from the North Carolina Broadband Infrastructure Office and the FCC’s form 477. The authors explain why FCC data is so flawed and provide examples of real people who’s lives are impacted due to access to broadband, or lack of it, in their community. Fiber is the best option for future-proof, fast, affordable, reliable connectivity. Wynia and Hovis compare fiber to other technologies and explain we can’t let hype cloud our long-term thinking. We were happy to supply our map of private ISP fiber availability in North Carolina so readers can see where it’s currently deployed in the state. Thirteen communities in central Vermont will ask residents if they want to authorize a communications union district, the first step toward a regional publicly owned Fiber-to-the-Home (FTTH) network. On March 6th, towns in Vermont will participate in Town Meeting Day 2018 when they’ll gather and decide a range of issues such as how to spend town funds, which policies to implement, and other choices that effect the entire community. For the past year, Berlin board member and computer science professor Jeremy Hansen has approached town officials from nearby communities to discuss the possibility of developing a regional network. As an elected official, his constituents have made him aware of poor Internet access in central Vermont. Currently, much of the area relies on DSL from Fairpoint with maximum speeds of 10 Megabits per second (Mbps) download and 1 Mbps upload, a far cry from the 25/3 FCC standard that defines broadband. There are also residents in the area that still use dial-up Internet access. "It is DSL," Diamantides explains. "The ‘S’ certainly stands for slow. The ‘L’ must stand for low. And we’ll let the ‘D’ stand on its own, I guess. But, it’s barely sufficient for what I need." 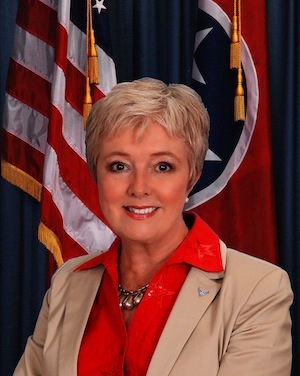 Hansen wants to improve connectivity in the region by establishing a communications union district, which is the model EC Fiber uses. The designation is much like a sewer or water utility, but focuses on delivering Internet access. EC Fiber began with a different model that relied on private investment, but when the state established the communications utility district designation, it was then able to seek financing from a range of other sources. That funding was critical to allow the network to expand, serve more subscribers, and continue to grow. The city of Ammon, Idaho, has used its open access publicly owned network to create an environment that encourages competition for residents and businesses. In addition to giving them control over which services they use and which companies they patronize, the city is doing its best to share information. In this video, the Ammon Fiber Optic Utility explains information financing for those who decide to connect to the network. Ammon is using a Local Improvement District (LID) approach to connect premises to the infrastructure. The city determines the boundaries of where the project will occur and property owners have the opportunity at the beginning of the process to pay for connecting to the network by attaching the cost over 20 years to their property. If property owners don’t take advantage of the opportunity during this window of time and decide later to connect, they must pay the estimated $3,000 - $5,000 out of pocket. As the video explains, connecting one’s property to the network raises its value and makes it easier to sell. It also points out that the cost of connecting stays with the property, so if a homeowner moves before the 20-year period is over, the new owners continue the payments for connecting. The video also explains an estimated monthly cost breakdown for hooking up to Ammon’s network. Keeping the community informed about their options keeps residents and businesses engaged in the process and aware of developments related to their network. Check out this short video about the LID #2 options and learn more from this report from Harvard University’s Digital Access to Scholarship at Harvard (DASH).